The Metal Muff with Top Boost pedal by Electro Harmonix could easily be perceived as the best distortion pedal on the market. 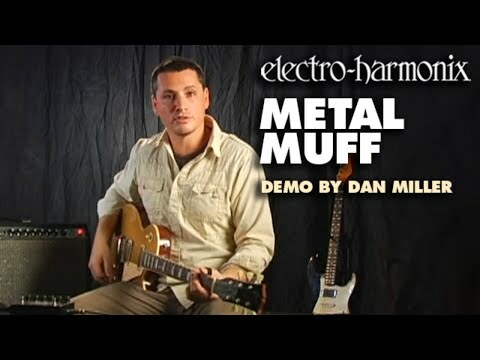 Whether you're a lead or rhythm guitarist, the Metal Muff has it all. With a simple interface and broad EQ encased in a reliable, durable die-cast chassis, the Metal Muff provides a whole universe of varied distortion tones. The Metal Muff pedal is indeed one hell of a monster. Featuring a 3-band EQ and an individual Top Boost knob, you have full control over the distortion, enabling you to create just the tone you're looking for. It also has a separate Distortion control pot for you to dial in the exact tone you want. The more you turn up the Distortion, the more the pedal can express its vast range of heavy tones. Electro Harmonix's 3-band EQ is an extremely prominent feature, particularly as it allows you to mold your midrange. This is important for any musician looking to recreate ultimate, classic metal sounds. Combined with this, the Top Boost control will enhance any lead riff or solo. In fact, it can make even the tamest of electric guitars sound brutish. The pedal has two separate footswitches, one for Boost (to control the Top Boost) and another is the true bypass switch. The pedal has a slightly larger chassis which is what allows for the two footswitches. The Metal Muff pedal comes supplied with a 9-volt battery so you can plug in and play from the moment you get it. The Electro Harmonix Metal Muff with Top Boost offers intense distortion, whether you're after classic, vintage rock sounds or modern, big metal tones. At a great price, this distortion pedal makes for an incredible investment.